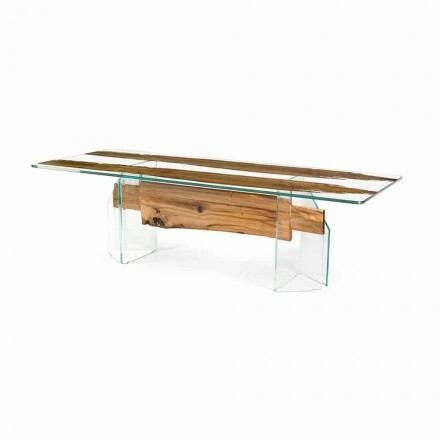 In this section of our website we have selected for you the best wooden tables of modern design for living room, kitchen and living area. Our proposals are all design models with rectangular, square and round shape with one, two, three and four legs in metal and wood. 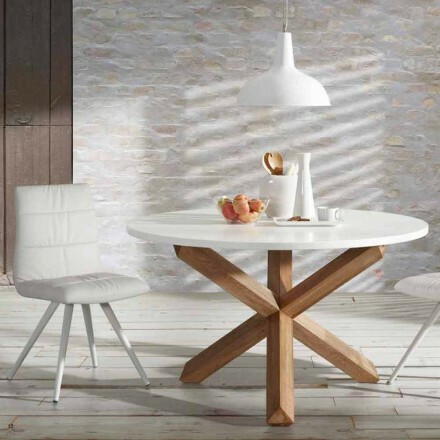 Elegant tables in natural solid wood of fir, ash and other precious woods available in natural color, lacquered or painted white, taupe and grey. Wood is a material that is extracted from the tree's trunks. Every type of wood has different properties: different colour, different density and different veining characteristics. - Solid Wood: it has a great worth and it is characterized by its great wear resistance and its aesthetic qualities. 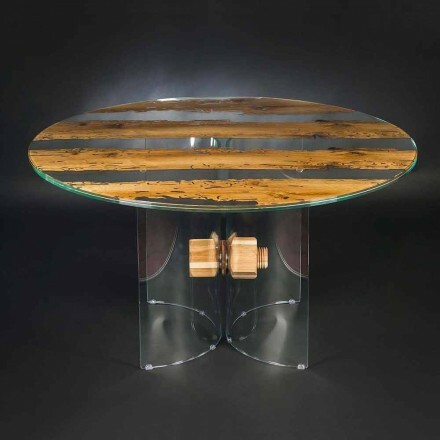 Being a natural and "living wood", it may be subject to colour and design variations; these characteristics represent the values that distinguish a product which is made out of a real wood. - Honeycomb wood: it is constituted by two layers of pressed sawdust, MDF or plywood, attached to a perimetral frame of wood, sawdust or mdf in order to obtain an empty panel on the inside. To increase its resistance in the empty central part, an impregnated layer of paper structured as a honeycomb is added. 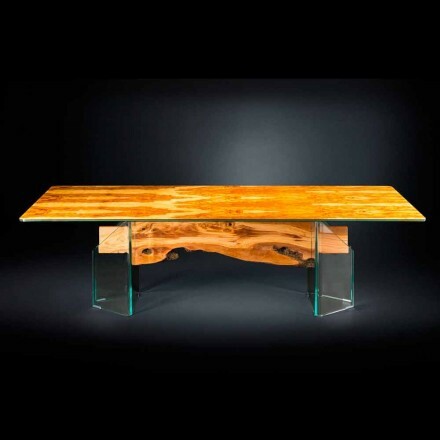 - Plywood: it is made by using layers of noble wood of low thickness extracted from high quality tree trunks. They are bonded and pressed on different supports (ex. sawdust panels or mdf). Then, they are finished in the desired colour or tonality. - Ennobled wood: this is a panel of chipboard wood covered in one or two sides with melamine paper (which is a synthetic material made out of thin paper sheets (about 10 mm), impregnated with melamine resin. Melamine is an economic and versatile material that can be used in different ways. It belongs to the ennobled panel family and it is composed of chipboard wood sheets covered by a layer of paper impregnated with melamine resin and a light resin made out of synthetic material. Melamine claddings are available in a wide chromatic range and textures. - Chipboard wood: fiber wood panels are composed of wood shavings that come from the scraps of the wood production. The wood shavings are mixed with binder materials and pressed in order to produce the panels. The obtained panels, can be different depending on the various types of wood shavings. 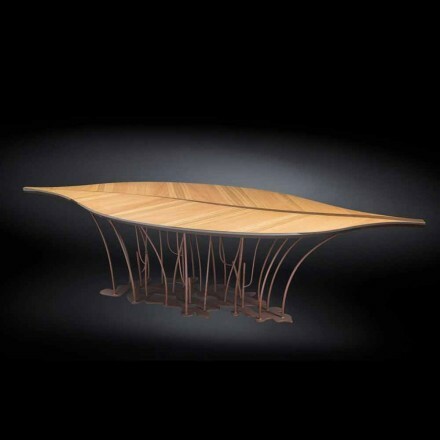 Every wood listed above, can be used to produce round tables with a diameter of 120 cm, 160 cm, 180 cm or customized tables. 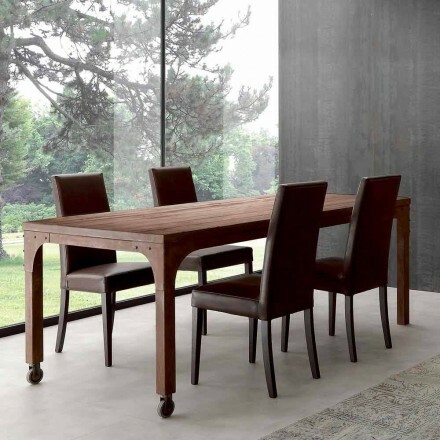 Furthermore, they are suitable for fixed and extendable dining tables from 120 cm, 140 cm, 160 cm, 200 cm. Wood is a natural "living material" and for its cleaning it is only necessary to use a soft damp cloth. It is important to avoid cleaning products as stain removers (which can contain acetone, ammonia, trichloroethylene or alcohol). The wood may suffer natural colour variations over time. 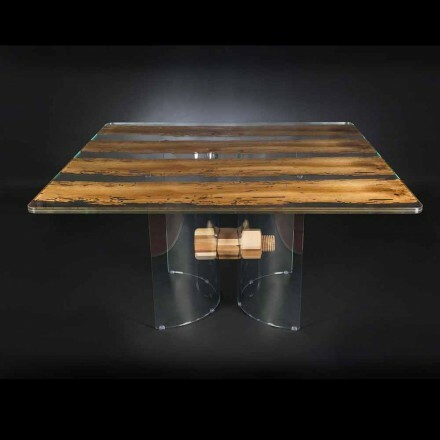 In order to delay this process, you should not place the table under the windows, exposing it to the direct sunlight. The MDF is an artificial wood. The acronym MDF abbreviates the words Medium Density Fiberboard. These are panels which are produced by a dry process from thin and uniform wood fibers that are bounded together through resins, heat and pressure. The MDF table tops have a uniform colour; unlike pure wood, it does not have veinings, facilitating its use and cleaning. The MDF can be totally recycled: once it could not be used anymore, you should take it to the ecological islands that you can find in any specialized center. MDF panels are characterized by their uniformity and homogeneity all over their thickness. 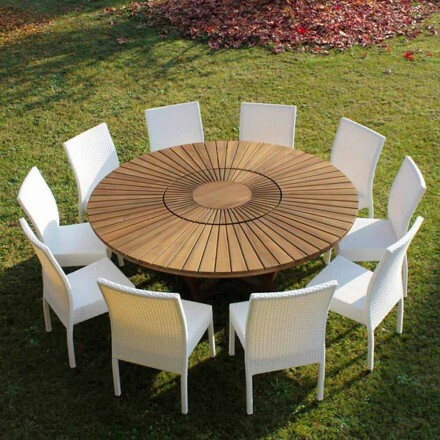 This material is appropriate for round tables with a diameter of 120 cm, 160 cm, 180 cm or customized tables. 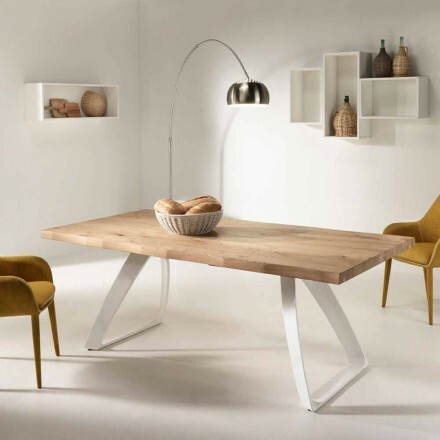 Furthermore, they are suitable for fixed and extendable tables from 120 cm, 140 cm, 160 cm, 200 cm. For a daily cleaning it is enough to use a damp cloth. - do not use cleaning products that may contain ammonia, otherwise the surface will become matte. - do not soak it excessively, too much water could lead to infiltrations and bubbles even if it is quite resistant to humidity. A laminate panel is obtained by undergoing a die casting process between the different elements arising from the woodworking: pressed sawdust, dusts, resins and wood fibers. Then, they are covered with a thin layer of aluminum oxide or melamine resin (that is why the wood laminate is also called "plastic laminate"). The surface of the panel, can have different finishes: satin, opaque, shiny or printed; it can also be decorated with a marble or wooden effect. Thanks to the die casting, the laminate is very strong and resistant. Sometimes this material is preferable to wood for the table tops production. It is durable and the colour lasts over time without suffering any kind of variation. Furthermore, it is easy to clean. This type of material, is suitable for round tables with a diameter of 120 cm, 160 cm, 180 cm or customized tables.